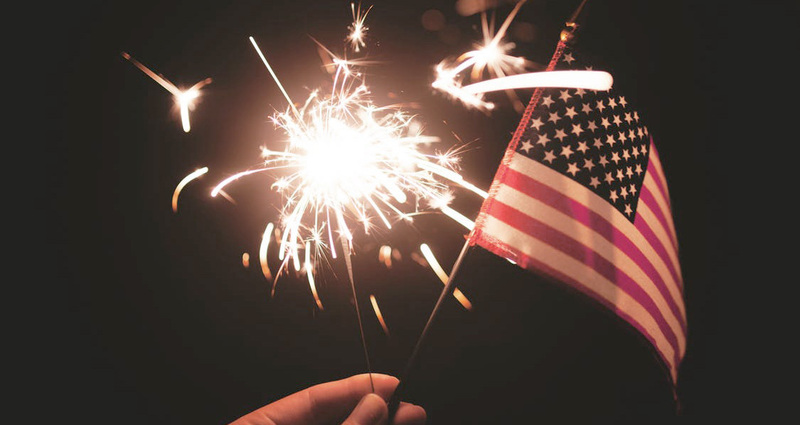 July Fourth is the day we celebrate the birth of the United States as an independent country. Our flag’s colors of red, white, and blue are everywhere you look as people celebrate the most patriotic day of the year. The Fourth of July is a great day to embrace this patriotic style and wear something in the classic American preppy style while you celebrate. We’ve put together a couple of stylish (and patriotic!) 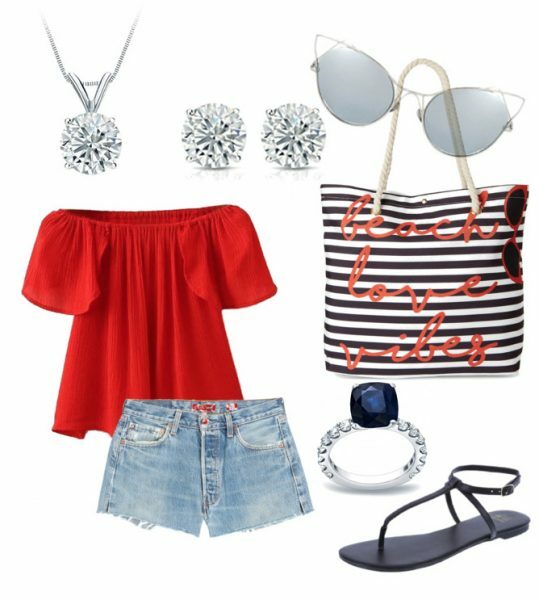 outfits with stunning jewelry pairings to help you celebrate America’s birthday in style! This casual look is great for daytime parties, picnics, and barbecues. 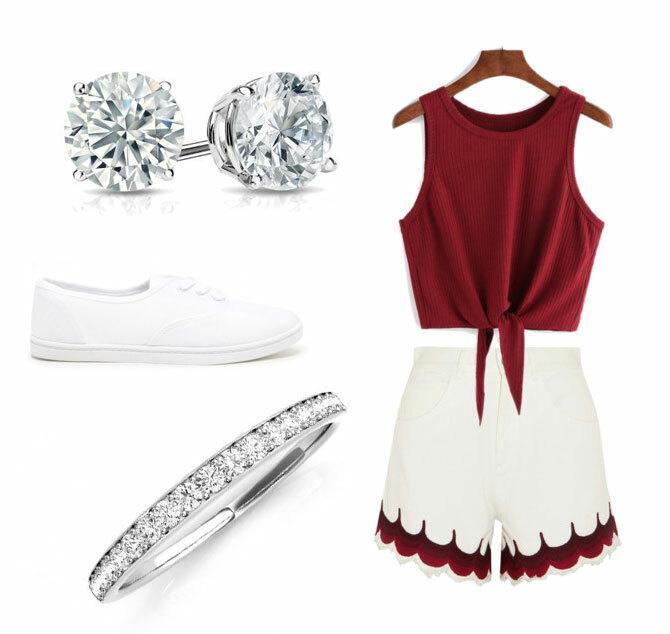 The deep red cropped tie front top pairs perfectly with these high waisted, ultra preppy white shorts. The shoes are a nod to the current athleisure trend. Be comfortable in your gear as you ease your way from the daytime festivities to the night’s fireworks display. The jewelry pairing for this outfit embraces its preppy style while keeping it simple as to not compete with the many trends in this outfit. These 4-Prong Basket White Diamond Studs in 14k Gold are the diamonds this outfit is missing. 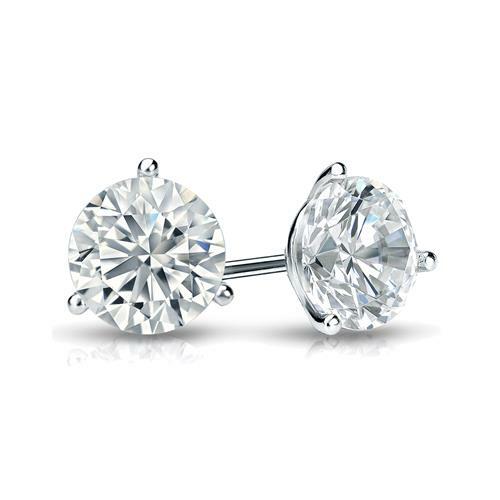 Diamond studs add a classic touch to any outfit. The Olivia ring completes this classic white diamond look by adding a dash of sparkle to your hand with its 20 stunning white diamonds channel set in 14k White Gold. This classic look is perfect for more upscale work or family parties. 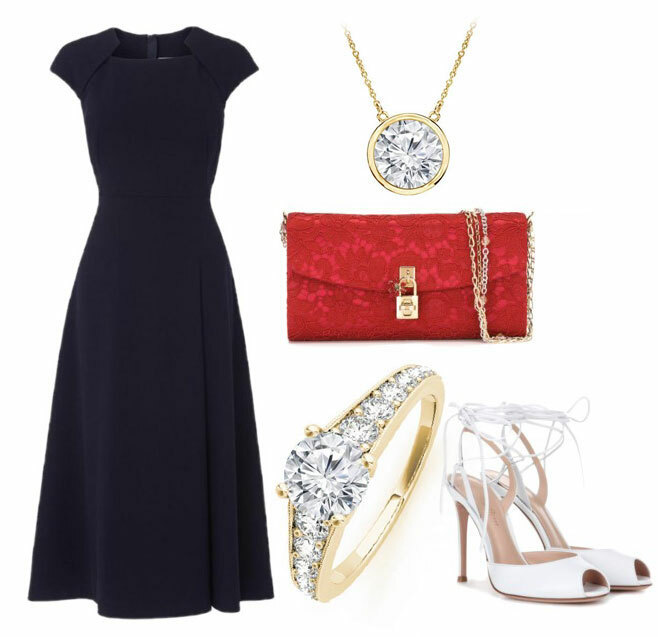 This simple, tailored navy blue midi dress lets these patriotic accessories take the focus of this look. Red, white, and blue pair perfectly with the traditional yellow gold in these accessories. Match the modern, linear feel of this look, with this bezel set diamond solitaire necklace in 14k gold. 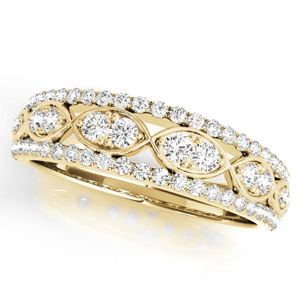 The Helena diamond ring in 14k gold completes this classic and elegant look by providing a stunning centerpiece that will dazzle. Are you thinking of buying a princess cut engagement ring? When buying any diamond, you will want to do your research in advance so you know what you’re getting. Every diamond is unique, and every diamond shape has unique elements. When buying a princess cut diamond, there are some specific things you need to consider. We’ve put together all the important information you need to know when buying a princess diamond, from the cut’s features, history, and advantages, to everything you need to consider when you are buying one. 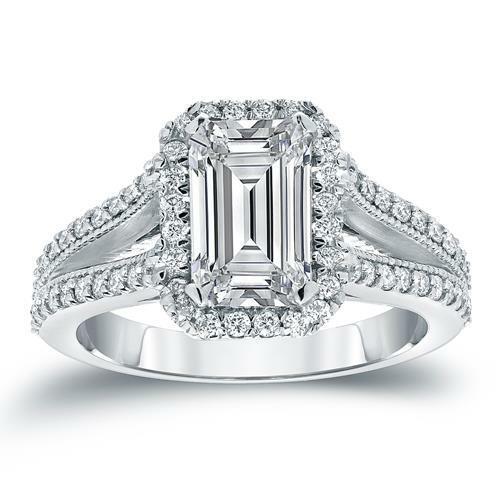 Check out our guide below for everything you need to know about princess cut engagement rings. So, what does a princess cut look like? From the top, a princess cut diamond resembles a square or sometimes a rectangle. 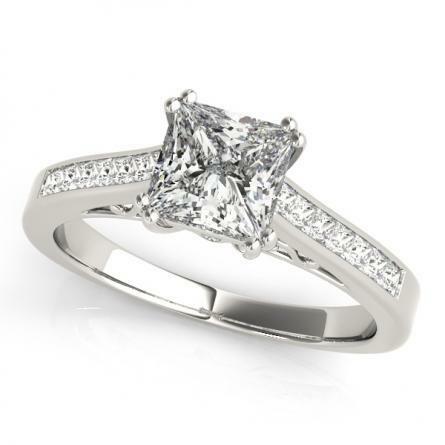 From the side, a princess cut looks like an inverted pyramid. Princess cuts are unique in that they can have a range of different facets. Most commonly, princess cut diamonds have 58 facets (the same as the most popular diamond cut, the round brilliant) but this can vary. Changing the number of facets on a princess cut creates different scintillation effects, creating the possibility of many unique kinds of shine. Princess diamonds have a classic look but are actually a relatively new shape. 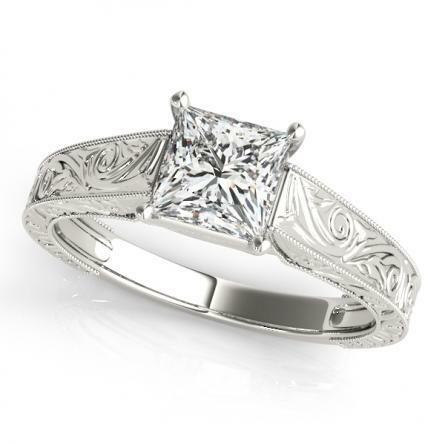 The princess cut was created in the 1960s when it was called the Barion cut. This shape became more strongly associated with the name “princess” in the 1980s and the practice of calling it a Barion cut became obsolete. Today, princess cut diamonds are the most popular fancy shape of diamonds, accounting for about 30% of all diamonds sold today. So, why should you choose a princess cut diamond? 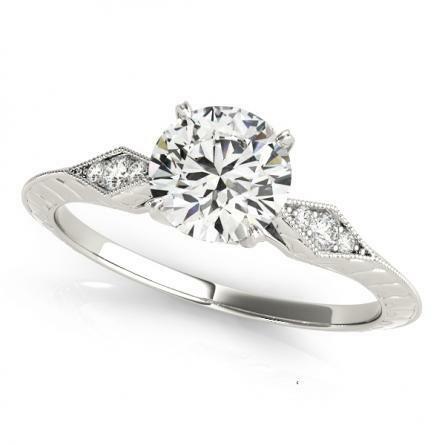 Well, most importantly you should choose a princess cut diamond if the style of the cut appeals to you. But there are other advantages of the cut that make it appealing. One is that princess cuts appear slightly larger than round cut diamonds of similar carats. This is because of the slightly larger surface area on the top of the diamond. Another advantage is that princess cut diamonds are a better value per carat. Generally, princess cut diamonds are a better price than round cuts because this cut allows the person crafting the diamond to use more of the raw diamond it is being cut from, thus saving the artisan money, and lowering the price for the consumer. 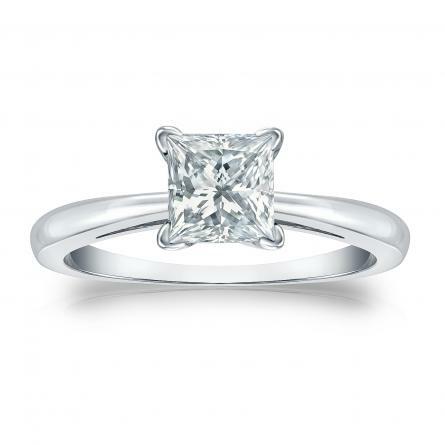 Another big advantage of princess cut diamonds is that they work with almost any setting. Other fancy cut diamonds, like oval or emerald cuts, need specialized settings to keep the diamond safely in place. But princess cuts are similar enough to the most popular cut, the round brilliant, to usually work with the same settings. Princess cuts are also popular enough on their own that many settings are made specifically for the cut. So what should you look out for when buying a princess cut diamond? Like all diamonds, you need to consider the grading of its 4Cs and decide what is most important to you in the grading of the diamond. 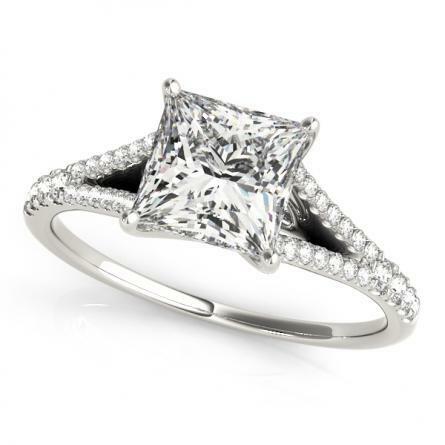 But with princess cut diamonds, in particular, the cut is extremely important. A poor cut drastically reduces the light and brilliance of a princess cut diamond. Hallmarks of poorly cut princess diamonds are pavilion bulges (a bulge on the side of the diamond caused by too steep of a slope) and a table percentage that is greater than the depth percentage. These reduce the beauty of the diamond and are to be avoided. You can see this information on a diamond’s GIA report, as well as the official grade of the cut. For princess cut diamonds, you’ll want to choose a diamond with an “excellent” or “very good” cut grading. You should also note whether or not the diamond is a square or slightly rectangular. To be considered square, the cut must have no greater of a ratio than 1:05 to 1. Note this about the diamond you are considering and decide whether or not you prefer a totally square diamond over a slightly rectangular one. The last thing to consider when buying a princess cut diamond for an engagement ring is the setting it will be paired with. Princess cut diamonds have vulnerable corners on the top of the diamond and must always be protected by the setting. You can see in the Lilac setting above that the four prongs of the setting surround these fragile corners. 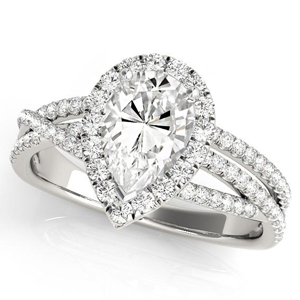 You should also consider whether or not the setting style you are thinking of goes well with a princess cut diamond. 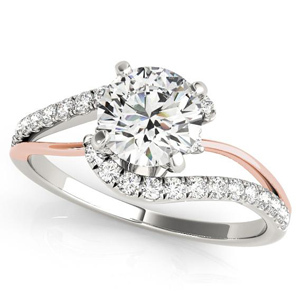 After all, the most important thing about the engagement ring you will buy is whether or not you love it. Make sure that a princess cut diamond will pair well with the setting you love so that you will be happy with your ring. 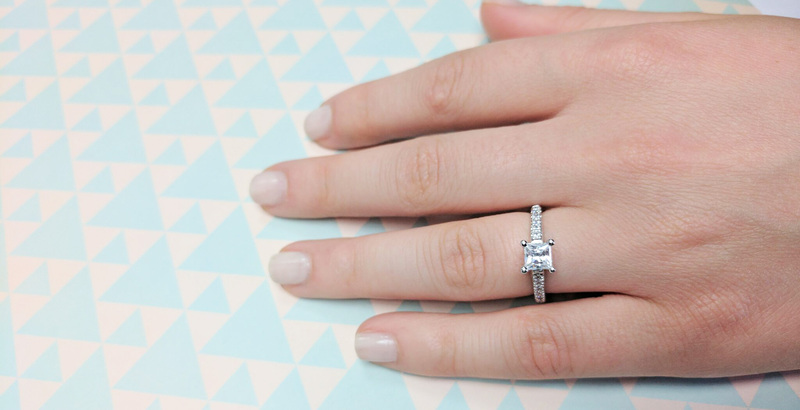 Is a princess cut engagement ring right for you? Check out our selection of beautiful princess cut engagement rings and find a ring you’ll treasure. Each year the Met Gala acts as both a fundraiser for the Metropolitan Museum of Art and a celebration of the grand opening of Costume Institutes yearly exhibit. 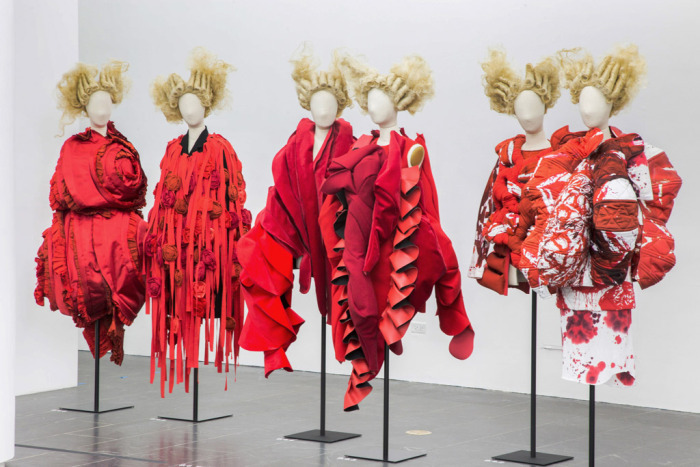 2017’s exhibit is called “Rei Kawakubo/Comme des Garcons: The Art of the In-Between” and honors and explores the bold, sculptural designs of the visionary designer Rei Kawakubo. 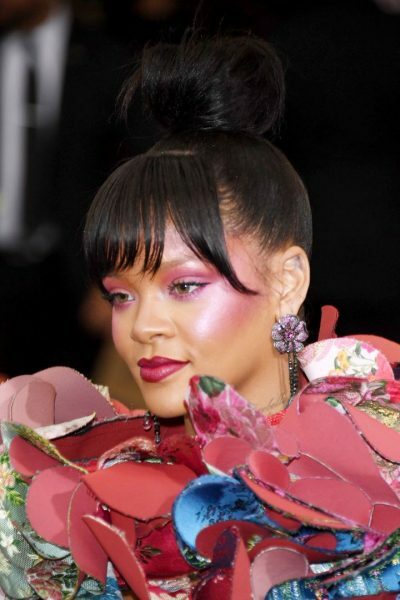 Celebrities and fashion insiders inspired by Kawakubo brought bold, larger than life looks to the Met Gala. 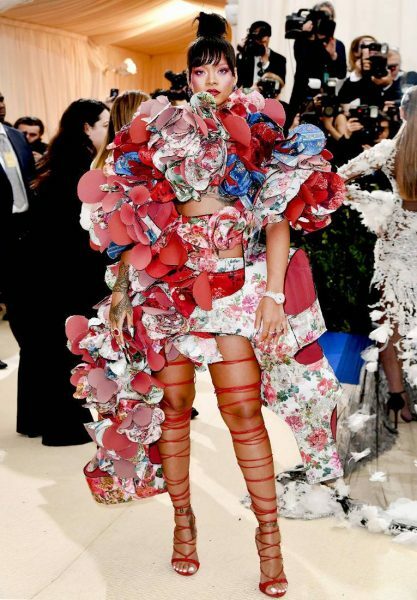 Structural and oversized pieces were popular, as can be seen on one of the most celebrated looks of the night, Rihanna’s colorful Comme des Garcons petal dress. So what kind of jewelry did the attendees wear to pair with their avant-garde ensembles? The trend was to go in one of two extremes: either wearing bold, colorful jewelry to extend the theme or wearing simple white diamond pieces to compliment ensembles without completely stealing the spotlight. 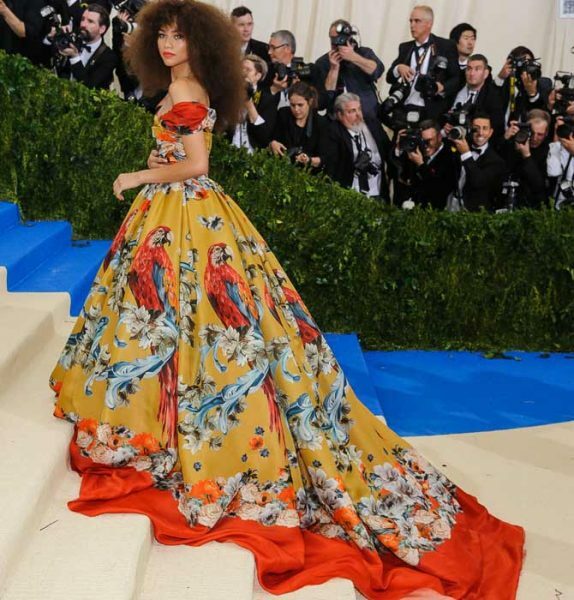 Zendaya had a standout look with her stunning parrot print Dolce & Gabanna dress, paired with an incredible 13 carat radiant fancy yellow diamond ring that echoed the dress’ vibrant color. Zoe Kravitz was among the stars that paired their bold look with simpler accessories. She paired her pink satin structured dress with black ruffled accents with some simple classic round diamond earrings and diamond rings. Elle Fanning went with both a statement piece of jewelry and simple pieces, donning a stunning aquamarine Art Deco hairband with diamonds and round diamond studs. Reese Witherspoon was another star who paired her asymmetric Mugler dress with an array of white diamonds, including her stunning emerald cut diamond engagement ring. While memorial day weekend doesn’t actually kick off summer, it can certainly feel like it does. This three day weekend sees a lot of people spending time with their families and friends and, because the weather is finally warming up, they are often spending this time having picnics, throwing barbecues, and heading to the water. To help you spend this weekend in style, we’ve put together a couple of summery outfits with patriotic touches. 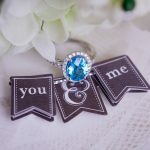 We’ve got two outfit ideas (one casual, the other more upscale) and, of course, some incredible jewelry pairings for each to give you some outfit inspiration! This look is perfect for a sunshiny day by the water or at a barbecue, or for when you’re hitting the mall. This outfit embraces some of summer 2017’s trends, like the statement sleeves on the red top and the lighter wash of the denim shorts, while keeping an overall classic look. Patriotic red, white, and blue make up the color scheme of this outfit without it being over the top. The paired jewelry is simple and classic, to add a little subtle sparkle to your look. 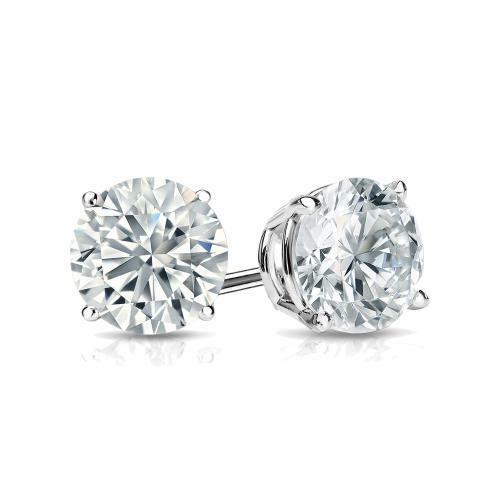 These round diamond studs are the ultimate classic earring. They bring casual elegance to your look while drawing the eye upward to the face. 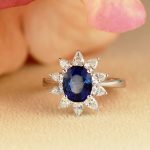 The matching round diamond solitaire pendant, as well as a stunning blue sapphire ring, completes the look, adding visual interest and subtle detail. 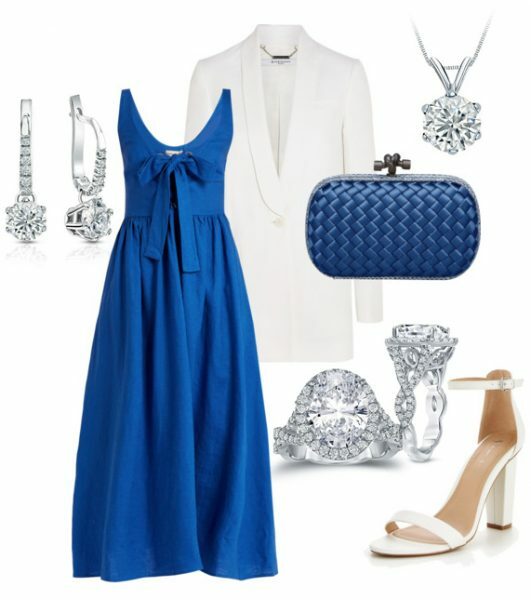 This more upscale look is great for attending parties and other events, or going out to dinner. The memorial color scheme is more subtle here, with royal blue and summery whites (though you could easily add a red lip or manicure if you wanted to add a touch of red). The paired jewelry enhances the elegance and unique elements of this look. The six prong setting on these stunning dangle earrings not only adds glamor but makes them unique. 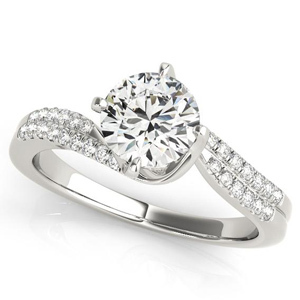 This setting is less common than a standard four or three prong setting and compliments the other diamond jewelry in this look. The solitaire necklace has a six prong setting and pairs perfectly with the dangle earrings and beautiful diamond ring. If you need sparkle to your ensemble, this is the perfect jewelry for that. We hope you got some memorial day inspiration from these outfits! And, if you’re thinking of stepping up your accessory game this memorial day, you’re in luck: right now Diamond Wish is having a Memorial Day special! Use promo code MEMORIAL to get $50 off on $499, $100 off on $999, $500 off on $4,999, and $1,000 off on $9,999. Take advantage of this limited time sale to add some of our classic fine jewelry pieces to your collection that you will enjoy for a lifetime! So, you finally found the one and you’ve got the engagement ring to prove it. 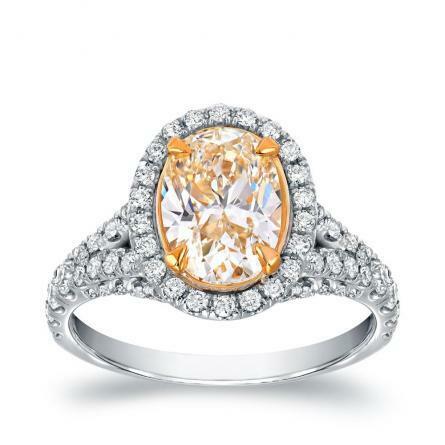 Your engagement ring is certainly a treasured item that you’ll be excited to wear for the rest of your life. But do you know how to take care of it? Since engagement rings are such delicate and valuable pieces of jewelry, they require a little looking after. But what do you need to do to take care of your engagement ring? We’ve put together a list of exactly what you need to do to keep your ring in beautiful condition. First things first, you’ll want to insure your ring. You may not think you need to insure your ring, but accidents happen. You need to be sure that you’ve protected your investment from theft or accident. Don’t skip this step! After you get your ring appraised and insured, you can rest easy that you’ll be protected from any unexpected issues. Make sure your fiancé got the right size for your engagement ring— for security reasons, your ring should be a perfect fit. This is because improperly sized rings (even if it’s just by a little) are at a much higher risk of slipping off. If you’re not completely sure that you have the right size, have the size checked out by a jeweler. You’re excited about your engagement ring and you probably want to wear it all the time. But you should know that it’s okay to take your engagement ring off sometimes, especially when you’d be putting it at risk of getting damaged. You should avoid getting harsh chemicals on your ring (like when you’re cleaning) and you shouldn’t do any vigorous activity with your ring on (like working out). You might think your ring is indestructible but it can easily be damaged by chemicals or being struck. A diamond might be sturdy but precious metals like gold or many precious stones (especially emeralds) can be easily damaged. Your engagement ring needs its own kind of annual doctor’s appointment: a check up at the jeweler. 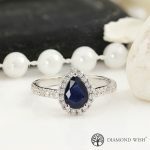 You should take your ring to be checked at a jeweler at least once a year to make sure that the setting is in place and that you aren’t at risk of losing any stones. This is a simple preventative step that you need to take to make sure your ring stays in good condition. You already know not to wear your ring while around harsh chemicals or doing vigorous activity. But remember not to put your ring in other dangerous situations. 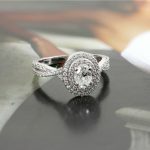 For example, don’t start leaving your ring carelessly around the house, and especially not around any sinks or bathtubs! Have a safe place where you can put your ring at home when you take it off. You should also remember not to take your ring off in public places, which could cause you to leave your ring behind. It’s also a good idea to avoid swimming with your ring on, especially if you’re going for a dip in the ocean. If your ring slips off into the Pacific, you’re not going to see it again. Finally, remember to clean your ring to keep it looking its best. You can try gently cleaning your ring at home with warm water (remember to never use chemicals on your ring), but really the best method for cleaning an engagement ring is a professional steam. Most jewelers can quickly and easily clean your ring. 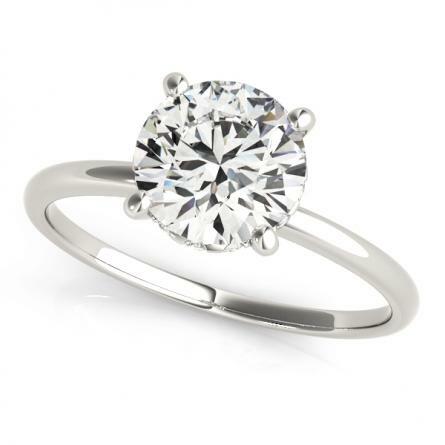 With an occasional trip to the cleaner, you’ll keep your ring shining as brightly as the day you bought it!